Axed Mashonaland West Provincial Affairs minister Webster Shamu yesterday said he will not question or judge President Emmerson Mnangagwa following his sacking from government on Monday, claiming it was not his place to do so. In an interview yesterday, Shamu said it was Mnangagwa’s prerogative to appoint or fire and he will not question the decision. “I am not the President,” he said when asked to comment on his sacking. Repeated efforts to get Shamu to respond to various questions were brick-walled, as he kept on saying it was not his place to comment on Mnangagwa’s decisions. “I am not His Excellency, the President. I am not here to stand as judge over His Excellency’s action. I have never done that in my life. I am not here to judge him, no, that is not my job. I am here to listen to what he say,” he said. Shamu has been in and out of government as a minister, but his recent sacking came as a surprise considering that elections were around the corner. Shamu is known for his excessive bootlicking of the Zanu PF leadership and at one point earned himself the nickname Cremora, after he likened deposed President Robert Mugabe to the coffee creamer. Previously, he was kicked out of Zanu PF in 2014 for allegedly supporting former Vice-President Joice Mujuru’s bid to take over from Mugabe. The former Zanu PF national commissar later bounced back at the end of Mugabe’s era as a Provincial Affairs minister in October last year, itself a shock decision and was reappointed by Mnangagwa. Yesterday, Zanu PF supporters in Mashonaland West celebrated Shamu’s sacking, with pirate taxi drivers blowing their horns and spinning their wheels at the former minister’s offices when news of his sacking filtered in. 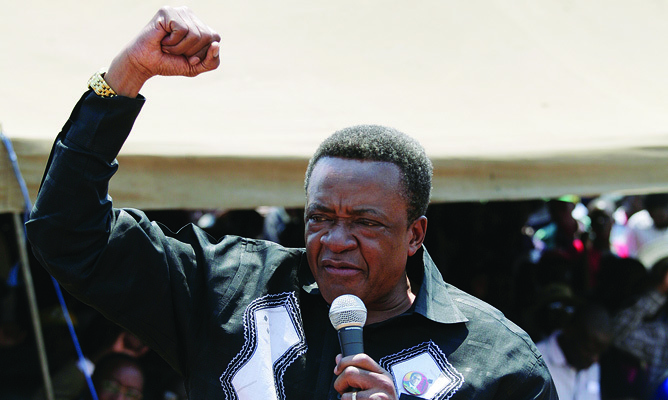 Shamu was accused by his colleagues in Zanu PF of protecting white former commercial farmers for a fee and belong to the “wrong basket” in the succession struggle.